katiemaytoo quilts: may UFO: done! Maybe being done so early this month will make up for my failure last month? Fresh out of the embroidery hoop (the stems on the upper right were last to be done), here are my 4 blocks, the chosen batch for the May UFO challenge. These blocks are relatively simple, so they go fast. Now it's back to working on the Whig Rose appliques from last month. But hey, I feel really good about these being done already. Not much quilting going on otherwise this week. Studying my brains out, but it will all be worth it in the end. 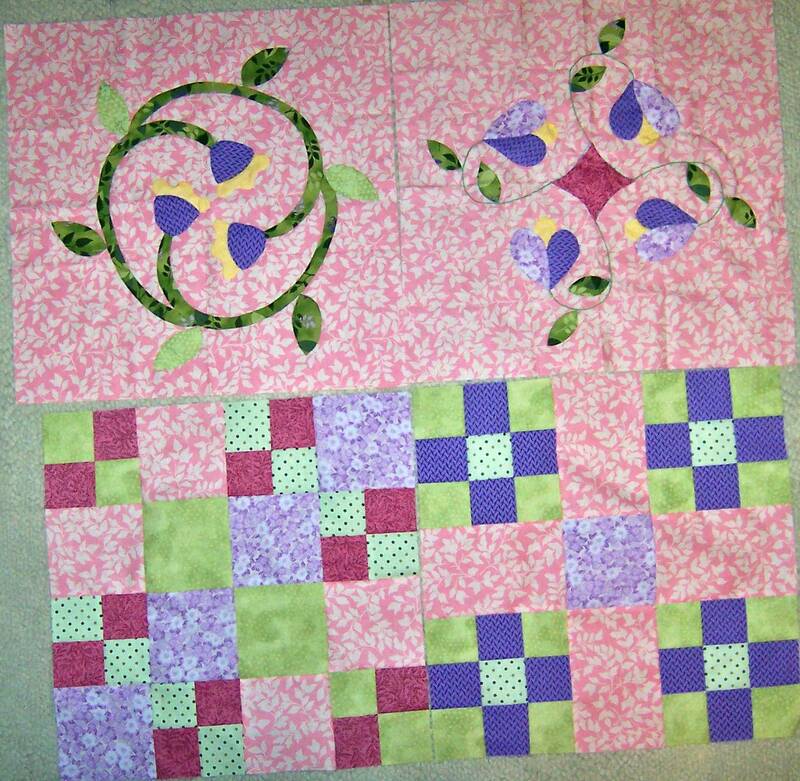 I hope to longarm quilt one of the three in the lineup next weekend, schedule permitting! PS I almost forgot! Happy Mother's Day! Your handwork is beautiful, and I love the colors and fabrics! My favorites! Happy Mother's Day to you too, as well as other readers! ---"Love"
These are beautiful, I love the colors. They are very Spring -y! Good luck with the studying! The applique looks amazing. Pretty blocks. You did get done quickly.You will be done with the Whig Roses applique before you know it. Enjoy your day. Hooray! (Big round of applause) Happy Mother's Day to you too! Wow Katie, good for you! I am beginning to think that the UFO challenge might be a really good thing. (It almost makes me wish that I had some UFO's.) I love the colours and fabrics, too. A good yarn is right--these are just perfect for spring--such lovely colors! Congrats on your progress in the right direction and a finish for May! Nice job! I've shuffled things around too, but getting done is what counts!